Sign up for Deborah's newsletter. Welcome to the web-world of Deborah da Costa, award-winning author of children’s books (and some other stuff). Deborah is also a psychologist, a reading specialist, a college writing instructor and a former classroom teacher in grades K-12. Today, Deborah spends most of her time writing for kids of all ages and speaking at schools and other organizations about her books and the writing life. She also enjoys supporting animal welfare causes, traveling, reading and hanging out with her handsome husband, talented children, adorable grandchildren and three very spoiled cats. 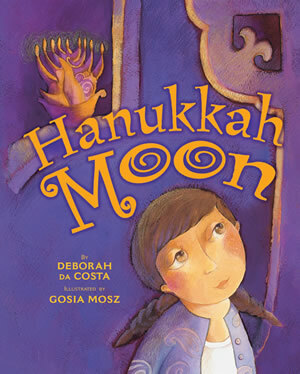 Read Deborah’s newest book, HANUKKAH MOON, and learn about the mysterious luna nueva!!!! Hanukkah Moon is now available in book stores and online book stores. Website by Technology Concepts, Inc.